Lust Minerals is an all-natural, vegan certified Australian Mineral Makeup Range, designed for the active woman, allowing a medium to full coverage. 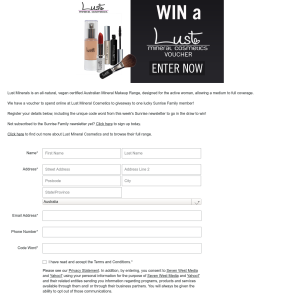 We have a voucher to spend online at Lust Mineral Cosmetics to giveaway to one lucky Sunrise Family member! Register your details below, including the unique code word from this week's Sunrise newsletter to go in the draw to win! Seven and affiliate broadcasting signals are received, and are subscribers of the Sunrise Family Newsletter. Cosmetics and their associated agencies and companies are not eligible to enter. 19 September 2018 at 10.00am (AEST) (“the Competition Period”). and telephone number, along with the code word as provided in the newsletter. 3.3 Entries must be received by Wednesday 19 September 2018 at 10.00am (AEST). 3.4 Entries are limited to one entry per person, per phone number. Multiple entries will not be accepted. the winners will not be entitled to any fee for such use. the actual prize value at the time of the draw. All prize values are in Australian Dollars. written consent of The Seven Network. 4.3 The prize cannot be altered in any way, is not transferable and cannot be redeemed for cash. directions from a regulatory authority. legal release in a form determined by the Promoter in its absolute discretion. Adelaide SA 5000 on Wednesday 19 September 2018 at 2.00pm (AEST). 5.2 The Winner will be notified by email or by phone by Friday 21 September 2018.
by Friday 21 December 2018.
in transit, or late, lost or misdirected mail. who tampers with the entry process, subject to state legislation. recommence it from the start on the same conditions, subject to state legislation. awarded in lieu of that element of the Prize. e) due to circumstances outside the promoter’s reasonable control. requirements, subject to State legislation. 7.2 The Sponsor is Lust Mineral Cosmetics (ABN 95 259 067 552) of Po Box 862, Buddina QLD 4575. 7.4 ACT Permit Number TP 17/02630, NSW permit number LTPM/17/02644.